The Pinocchio rating has been updated in light of new information. In justifying his controversial executive order halting travelers from seven majority-Muslim countries, President Trump claimed that President Barack Obama did the same thing in 2011. But the comparison is a bit facile. Here’s what happened in 2011. The “Kentucky case” refers to two Iraqis in Kentucky who in May 2011 were arrested and faced federal terrorism charges after officials discovered from an informant that Waad Ramadan Alwan, before he had been granted asylum in the United States, had constructed improvised roadside bombs in Iraq. The FBI, after examining fragments from thousands of bomb parts, found Alwan’s fingerprints on a cordless phone that had been wired to detonate an improvised bomb in 2005. The arrests caused an uproar in Congress, and the Obama administration pledged to reexamine the records of 58,000 Iraqis who had been settled in the United States. The administration also imposed new, more extensive background checks on Iraqi refugees. Media reports at the time focused on how the new screening procedures had delayed visa approvals, even as the United States was preparing to end its involvement in the Iraq War. “The enhanced screening procedures have caused a logjam in regular visa admissions from Iraq, even for those who risked their lives to aid American troops and who now fear reprisals as the Obama administration winds down the U.S. military presence,” the Baltimore Sun reported. A U.S. Embassy official in Baghdad, speaking on condition he not be identified, acknowledged “unfortunate delays” in issuing special visas, the result of enhanced security clearance procedures, some instituted after the Kentucky arrests. But he said recent changes would speed the process. The State Department’s National Visa Center has been ordered to flag special visa applications for expedited action, the official said. And a requirement that Iraqi applicants provide an original signature on certain forms sent to the U.S. has been dropped after Iraqis complained of logistical difficulties. “We are making changes, ordered at the very highest levels, that will help shave time off the application process,” the official said. At a September 2011 congressional hearing, Sen. Susan Collins (R-Maine) asked Homeland Security Secretary Janet Napolitano if a hold had been placed on Iraqi visa applications. The new rules were stringent, the Economist reported, and resulted in some turmoil. State Department records show there was a significant drop in refugee arrivals from Iraq in 2011. There were 18,251 in 2010, 6,339 in 2011 and 16,369 in 2012. But it’s unclear that equates to an actual six-month pause in visa processing, rather than a dramatic slowdown in approvals as new rules were put in place. One news report said “pace of visa approvals having slowed to a crawl,” indicating some were still being approved. So what’s the difference with Trump’s action? Second, Obama did not announce a ban on visa applications. In fact, as seen in Napolitano’s answer to Collins, administration officials danced around that question. There was certainly a lot of news reporting that visa applications had slowed to a trickle. But the Obama administration never said it had a policy to halt all applications. Indeed, it is now clear that no ban was put in place. Even so, the delays did not go unnoticed, so there was a lot of critical news reporting at the time about the angst of Iraqis waiting for approval. Third, Obama’s policy did not prevent all citizens of that country, including green-card holders, from traveling to the United States. Trump’s policy is much more sweeping, though officials have appeared to pull back from barring permanent U.S. residents. We have sought comment from the White House and from Obama administration officials and so may update this if more information becomes available. But so far this is worthy of at least Two Pinocchios. 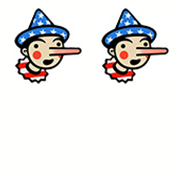 Update: In light of the response from Obama administration officials that there never was a point when Iraqi resettlement was stopped or banned, we are updating this ruling to Three Pinocchios. Iraqi refugee processing was slowed, in response to a specific threat, but it was not halted. The Trump White House, meanwhile, has failed to provide any evidence for its statement.